10 Jan 2019 Lausanne - A team of Swiss National Centre of Competence in Research - NCCR MARVEL PIs has won a swissuniversities P-5 grant to further develop the Materials Cloud web platform for Computational Open Science. The project will ultimately allow users to autonomously contribute hundreds of different data entries in the different sections without having to interact with one of the platform maintainers. A data generation platform strongly coupled with an archive and a sharing platform for open research data, Materials Cloud assists scientists in data dissemination, curation and publishing with DOI. The multi-disciplinary team made up of Giovanni Pizzi, École Polytechnique Fédérale de Lausanne (EPFL), THEOS Lab; Joost VandeVondele, Swiss Federal Institute of Technology in Zurich (ETHZ) and the Swiss Supercomputing Centre (CSCS); Nicola Marzari, EPFL, head of THEOS Lab and Director of NCCR MARVEL; Berend Smit, EPFL, head of the LSMO Lab; and Oleg Yazyev, EPFL, head of the C3MP Lab, will use total funding of nearly CHF1.3 million in the next two years - half coming from swissuniversities, half from matching funds including the NCCR MARVEL and the H2020 MaX Centre of Excellence - to scale up the Materials Cloud infrastructure to meet the needs of the whole scientific community, first in Switzerland and extending to Europe and beyond, while at the same time making sure that the infrastructure is stable, available at all times, and flexible enough to support even more data types and scientific fields. Materials Cloud focuses on computational data, specifically on two essential components: assisting researchers in data generation as well as tracking, visualizing and publishing the controlled conditions under which the data was generated. This sharing platform, thanks to a rich web interface, allows users to browse the data, navigate its provenance, visualize it, and download it for further use, making data fully accessible and interoperable. The funded project will be divided in five workpackages that address different needs of the scientific community as well as the technical challenges for scaling-up the platform. "In particular, also thanks to the partnership with the Swiss Supercomputing Centre (CSCS) that hosts the infrastructure, we will develop the needed interfaces, authorization protocols and software tools to enable users to autonomously contribute hundreds of different data entries in the different sections, without the need of interacting with one of the platform maintainers", stated Giovanni Pizzi, project manager of this new grant. "Moreover, thanks to the collaboration within the team of PIs, we will be able to address the needs of various disciplines including Materials Science, Computational Physics and Computational Chemistry." 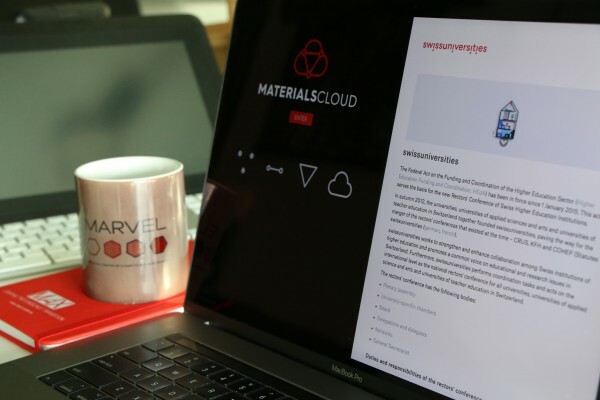 First developed in 2015 and public since December 2017, Materials Cloud already provides data on materials computed by more than 100.000 calculations. It is powered by the software framework AiiDA , which provides automation of simulations and workflows as well as completely automated provenance tracking to ensure reusability and reproducibility of all computational research. AiiDA has already a collection of plugins supporting almost 60 different simulation codes and implementing various relevant scientific workflows. The combination of AiiDA and Materials Cloud constitutes an open-science platform that couples automation of simulations and workflows with data provenance tracking to guarantee reproducibility, and FAIR data sharing of the results, a quite unique collection of features in the field of Computational Materials Science.